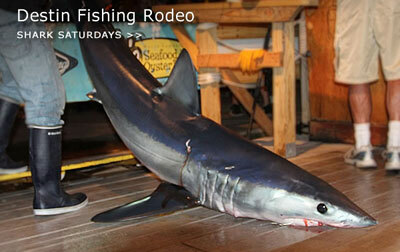 We’re halfway through the month-long Destin Fishing Rodeo. The tournament may be the last one in Florida where the bodies of sharks are brought to the docks and gruesomely hung up for the amusement of the crowd (there are other catch-and-release shark fishing tournaments in Florida). In recent years there has been a positive change in the way we view sharks. More and more Floridians recognize sharks as magnificent creatures who are essential to the ocean ecosystem. Several shark killing contests have ended. The Outcast Mega Shark Tournament in Pensacola was cancelled in 2013. The St. George Island Shark Fishing Tournament and the Sarasota Shark Tournament both fizzled out after the 2009 events. Please contact the following sponsors of the Destin Fishing Rodeo’s “Shark Saturday’s” and ask them not to support the cruel and senseless killing of sharks. Contact the City of Destin and let them know that the shark killing contest is a black eye for the community. Urge the Mayor and City Council to speak out against the contest. Sharks need to be protected, not slaughtered in tournaments that encourage inaccurate and harmful images of sharks. (Fort Pierce, FL) — The Animal Rights Foundation of Florida (ARFF) has sent a letter to the National Association of Letter Carriers, Branch 1690, protesting a donkey basketball fundraiser to be held October 5 at the Fenn Center in Fort Pierce. During donkey basketball games, donkeys are mishandled by participants who have no animal-handling experience. The animals are often yelled at, dragged, shoved or kicked when they don’t cooperate. In addition to concerns for the welfare of animals, these events place the public at risk. Participants can fall from donkeys’ backs, or may be kicked by mistreated or frightened animals. During a donkey basketball fundraiser in Pinellas County in 2003, a woman was either bucked off or fell from a donkey. She suffered injuries and later sued the event organizers.